This vintage Art Deco red and pink ostrich feather folding fixed flapper fans dates from the 1920s. Included are two fans; one is made of a single large fluffy pastel pinkish purple lilac color dyed ostrich feather plume. This beautiful boudoir fixed fan has a faux tortoise shell handle and is missing the bottom loop which has broken off. It measures 24 inches long and 10 inches wide. The other fan is made of a dyed reddish orange color fluffy ostrich feather plumes. 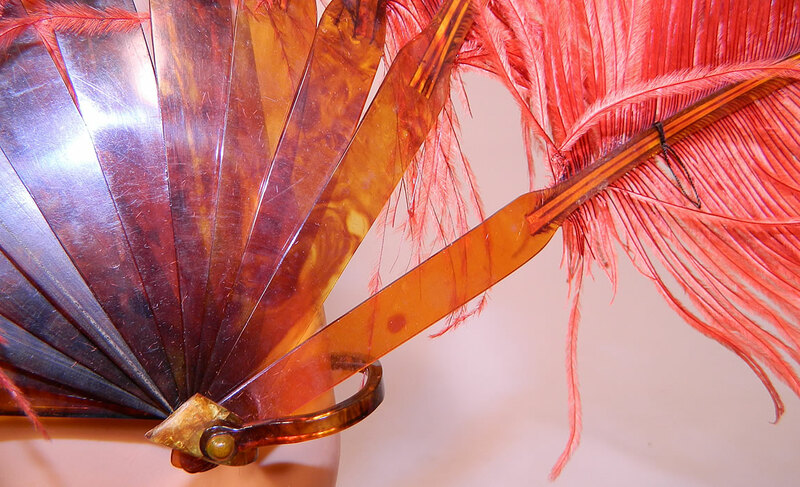 This fabulous flapper folding fan has faux tortoise shell celluloid sticks, guards and loop rivet on the bottom. The fan measures 18 inches long and 30 inches wide when opened. It is has a broken missing stick and loose string holding a feather in place (see close-up). They are both in good as-is condition. These are truly wonderful pieces of feather art!